Choose your tower height! Install them in your home or in a greenhouse! Use them with aquaponics or hydroponics! PREFACE: Potential customers on this website are expected to already have experience in plumbing, general construction, and operating a productive aquaponics/hydroponics grow system. The only thing being promoted on this site is a tower design, anything above and beyond that is on the person implementing the towers within their existing system. Much the same way that the manufacturer of a plumbing part expects you to know how to implement it. If you are wanting step-by-step guidance, there are subscription services for that purpose. You may be asking yourself, what makes the 3D G-Tower design better than the so-called “most proven design” on the market? Just looking at this tower design should answer that question for you. Say you have a 5-foot tower with a single slot up the front and you want to grow lettuce. Since market size lettuce generally matures at 8 inches in diameter, where are the heads going to grow if you plant them 4 inches apart as shown in their videos? Even if you planted them at the recommended spacing on the seed packet, a 12 segment 3D G-Tower based on 3×3 segments can still grow 5 more market size plants than their 5-foot tower. But, what about those pockets that you glue on to the side of a PVC pipe? They charge the same amount for each pocket as a 3×3 segment costs to purchase, but the 3D G-Tower doesn’t require you to buy PVC pipe that you have to drill out and then glue the pocket to the side of the pipe (and then hope it doesn’t leak). Then when you have to clean out either of these other two tower options, you also can’t take them completely apart and wash them in a sink. The 3D G-Tower is clearly the better design of all 3 options just mentioned here! The 3D G-Tower is a vertical NFT tower and does not require any media in the tower. Since, unlike “the most proven design” on the market, plants don’t need media in order to keep them from falling out of a 3D G-Tower. NFT is one of the most proven methods used in soilless gardening! The 3D G-Tower stands the NFT method upright in order to allow a person to use the volume of their growing space rather than just their available square foot area. 3D G-Towers can be made any height you want (within reason) at 4 segments per foot using 3×3 segments or 3 segments per foot using 3×4 or 4×4 inch segments. 3D G-Towers are supported from the bottom-up with parachute cord running from the base up through the inside and out through the cap. They do not fall over or fall apart after they are installed and they do not leak if printed or sealed correctly. 3×3 inch segments have a 1.5 inch planter pocket which will easily support up to a 1.75 inch plant starter plug and prevent it from falling into the tower. 3×4 and 4×4 inch segments have a 2 inch planter pocket that will accept a 2 inch netpot and your choice of plant starter plug or loose media. All 3 segment sizes are a compatible fit with standard 3 inch or 4 inch PVC drain line and fittings, thus requiring no special plumbing parts. Caps accept up to a 3/8 inch OD water feed line. 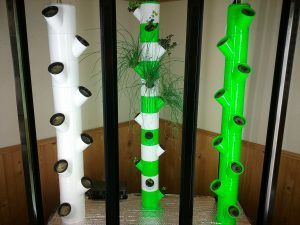 3D G-Towers work equally no matter what type of soilless gardening method you choose. They have been tested with aquaponics, hydroponics, and bioponics (compost tea hydroponics). 3D printing creates thousands of ridges and surface voids in every part which are extremely beneficial to aquaponics and bioponics due to the enhanced biological surface area this creates. The fertilization method that you choose all depends on your experience level or what you feel that you are willing to learn. Water or nutrient flow rate is determined by the soilless gardening method you choose. The general rule with aquaponics and bioponics is to circulate your entire body of water through your system at least once per hour. Certain hydroponics methods require you to run your nutrient pump intermittently, for example, 15 minutes on and 45 minutes off. All you really have to do is make sure there is enough flow to make your water/nutrient come out of all openings in the bottom of the cap. 3D G-Towers do not dictate or change how your system runs, they simply give you a more efficient and productive system. Lastly, while there is a lot of negative hype regarding the use of 3D printed items in a greenhouse, please keep in mind that this is all greatly exaggerated. For example, standard UV treated greenhouse poly drastically attenuates UV light, while polycarbonate and tempered greenhouse glass block it all together. 3D G-Towers are more likely to be damaged by mishandling than from UV light degradation. Also, PLA plastic doesn’t even begin to get pliable in an oven until it reaches 200F. Your plants would be dead long before the towers ever got hot enough to melt, especially since they’re constantly water cooled. Please Note: People are strongly encouraged to utilize the forums on this website since not every possible question that a person might ever have could be anticipated and answered in one page. Chances are that somebody else has already asked and answered your questions in the forums. Copyright © 2019 3D Garden Tower. All Rights Reserved.